You’ll be coming back for seconds when you try these mashed sweet potatoes topped with a sinful spiced brown butter. Peel sweet potatoes and cut them into chunks or slices. Steam in a tightly covered pot on a rack over boiling water until completely tender when pierced with a sharp knife, 15 to 20 minutes. Sweet potatoes can also be steamed whole with the peel on. Increase time accordingly and slip off skins when cool enough to handle. To make the brown butter, in a small saucepan, melt butter over medium heat. Throw in sage or rosemary and spices. Continue to cook until butter foams, the foam subsides, and butter begins to darken. Swirl pan from time to time to ensure even cooking. When butter smells toasted and nutty, it is ready. Remove from heat and strain through a fine-mesh sieve. Warm cream in a small saucepan. Do not boil. 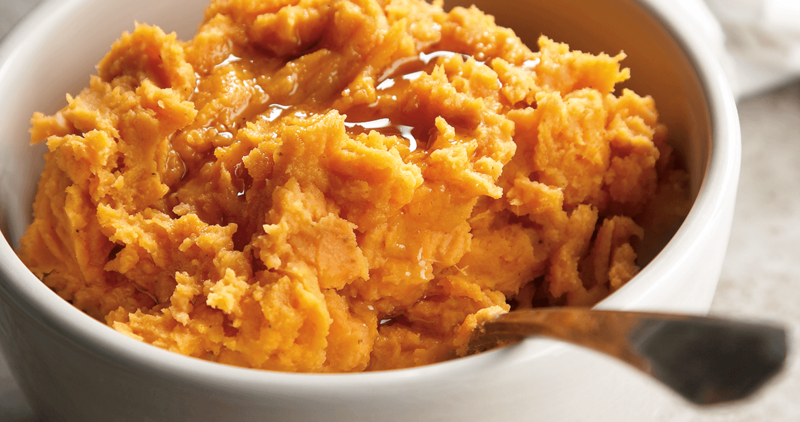 While still hot, puree sweet potatoes with cream in a food processor until smooth. Alternately, press sweet potatoes through a fine-mesh sieve, process in a food mill, or mash with a potato masher, then whisk in cream. Mix in all but a tablespoon of the brown butter mixture and season with salt and pepper to taste. Drizzle with the remaining butter.